Private parking is across the street. There are also other private options in the area should the lot be full. Please contact us at info@thedjangonyc.com for further inquiry. Doors open at 7pm. Live jazz Tuesday through Saturday from 7:30pm until late. 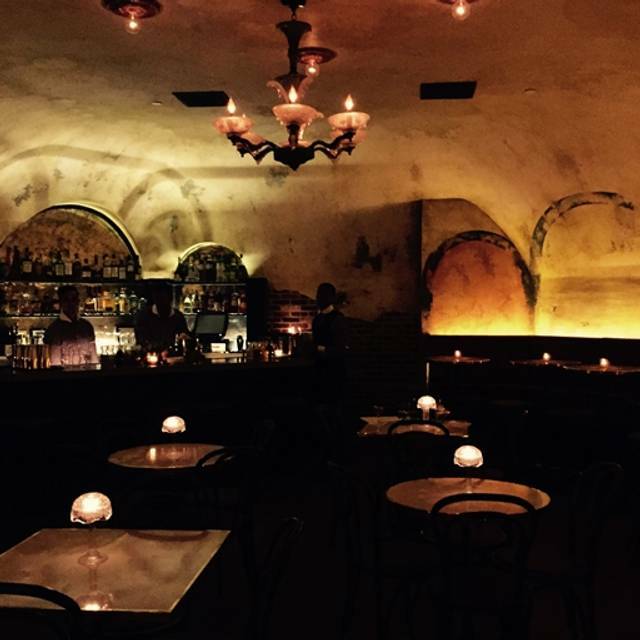 The Django at The Roxy Hotel is a full service Jazz Club and Cocktail Lounge. Join us for an evening of expertly crafted cocktails, live music performances from some of the best musicians in New York City and beyond. For a guaranteed table, please make a reservation on OpenTable. Please be aware that The Django has two shows per evening: 7:30 & 10/10:30pm. Reservations are available between 7-8pm and and 10-11pm respectively. Booking for the first show only allows entry for the first show. Walk-ins at the bar are first come first serve. Please check our website for nightly programming, cover charge and drink minimum policy. I wanted to love this place, since it translates really well into Instagram! The prices were too dang high, unfortunately, for the caliber of musicianship I experienced that evening. The chicken sandwich was tough and slippery, a combo more suited to an outdoor picnic, not a fancy night out. Room was super air conditioned, which I didn’t understand. Our waiter was fine, and it was overall ok, I’d just rather go hear jazz at Small’s or Mezzrow. Thanks. The live big band made the night. Swing dancing was fantastic. Food was ok. Cocktails were good. Everything about the night was wonderful except for our particularly unfriendly and inattentive waiter. We had a great time though and will definitely come back! Music, dancing, and drinks can’t really go wrong. Amazing music and ambience! Music is a bit loud to have conversation but great spot to go for post-dinner cocktails and dancing! I won't come back to this place. The concert was nice but they make you loose your money, the cocktails are very expensive and the food too. We spent like 1 hour there and paid 100 dollars. Thank you for a lovely evening. We came especially to see Hillary Gardiner, and she was fabulous. Great, cool spot. Slow service and a bit pricey, but with it for the cool vibe and great tunes. We had an amazing time listening to blues band, dancing and enjoying this great venue. Recommend it. Amazing experience. The service and music was exceptional. I highly recommend. Travis! Thanks for coming out. We look forward to welcoming you back soon. Jack. Service was the worst I have seen in New York. Waiter kept forgetting parts of our order. It took him 20 minutes to get me a glass of wine. Their only saving grace is that they invite outstanding musicians. The music was out of this world. It was an unforgetable night. Celebrated my mother’s birthday. The band was amazing, food and service too. I’ve already recomended!! Thank you thank you thank you! So nice to hear you had a great time. We look forward to welcoming you back. Went to see the Steven Feifke Big Band. Awesome show!!!!!! We agree, he is always a good time. Glad you had an enjoyable experience. We look forward to welcoming you back. Incredible experience and amazing place. Ambience was spectacular, but service was severely lacking. It's the second time I've been to Django, and both times have had a problem with the very slow service. Hello, Thank you for your feedback. We do send a receipt message sent out to all reservations through OpenTable to provide detailed information about our entry policy as it varies night to night. We also like to make sure this information is also well documented on our website and within our menus and repeated within phone calls and upon entry. We do apologize for the misunderstanding and hope you might be able to provide more insight on how we can better distribute this information. It was an incredible experience, my husband and I enjoyed amazing cocktails while listening a wonderful jazz band. We couldn’t be more pleased . Always amazing when Prof Cunningham and His Old School performs. 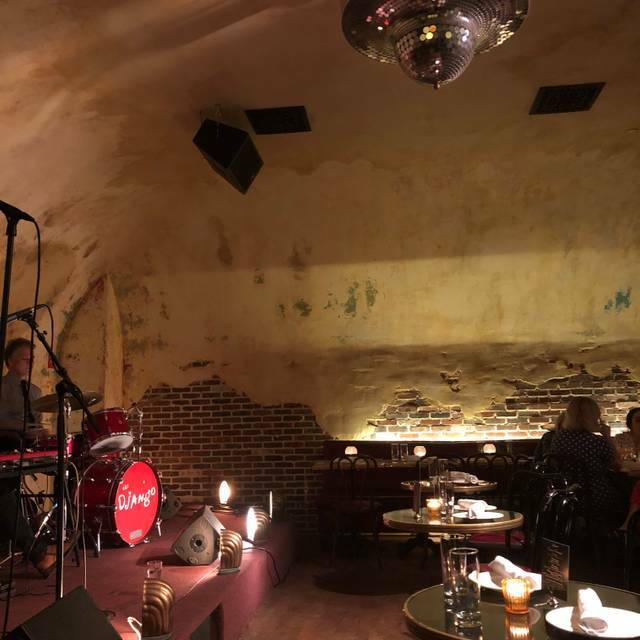 Servers don't come around enough for orders, but the music performance, ambiance and dancing make this the best experience you can get in manhattan. Blair, Glad to hear you had a good time. Thank you for the feedback on service. Jack. What an amazing place. The room and music was perfect. You reserve a table and watch the band. The food was delicious and the drinks were even better! I will definitely be back! Music was great. Cocktails Okay. Food is kinda of ok.
We really enjoyed our time, the drinks were wonderful with some great twists! The first group we heard was a traditional jazz trio and they were great. The second group, however was quite loud. We ended up leaving because we couldn't talk to each other. No fault of Django! The service, food, drinks were all top notch! Was my husbands birthday and brought a couple friends, had front row tickets and the music was awesome! Glad to read you had a great time! Music was out of this world. Top jazz. This was as amazing as a top jazz venue in Paris. If you want world class jazz & outstanding mixologist cocktails go to Django. Service was also outstanding. We only had the crudete with hummus & the fries. Not mind blowing but it’s a snack. It was fine. The free snack of trail mixes etc was also nice. Very energetic and beautiful space. 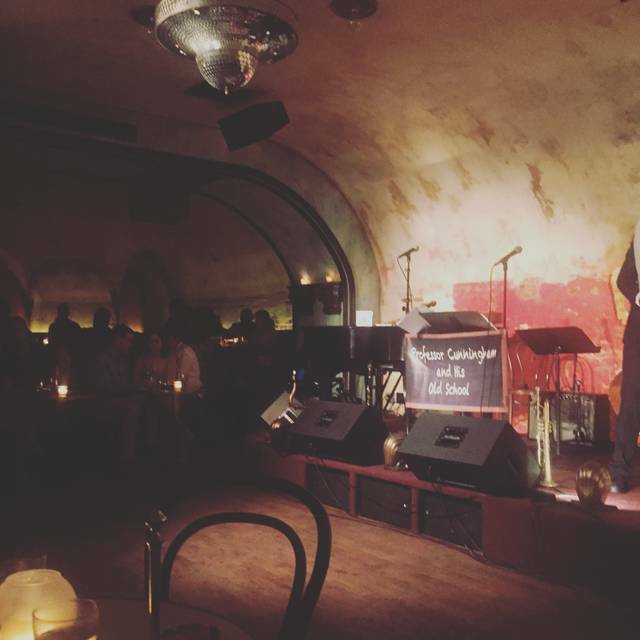 I felt like I was in a European jazz / wine cellar with a high energy NYC vibe and world class jazz. I brought my boyfriend here for a special occasion. He loved it and we had a good time. I would for sure go again! Natalia, I'm delighted to read you had a good time. We look forward to welcoming you back! Jack. Awful, terrible, arrogant service. Great music and good vibes but the level of respect in regards to the service was truly insulting. The Django made for a great date night. The music was excellent, and the ambience very cozy and thoughtful. Food and drinks are very pricey, but expected for being a part of the hotel. They turn the tables, so we had to make our way back to the bar to enjoy the second set, which we didn’t mind. I’d highly recommend checking this place out for a night of great live music. Stephanie! Thanks for coming out and sharing your feedback. Please drop me a line when you hope to return so we may welcome you and your guests properly. Jack. Very poor service from the waiter, manager not helpful at all when we had an issue. Food was good but doesn’t balance the poor service and how customers are treated. Very sorry to hear about your negative experience with us. It seems to have been due to a misunderstanding that you and your guests could remain at the table for both shows. This, as we discussed and read about on the website + menu, is not the case. Reservations are made on a per show basis. Unfortunately, extending your reservation was not possible on the night of your visit, although we tried. We hoped inviting you to enjoy the rest of the night in our bar room would help ease the confusion. Table was the worst. Back was towards the band. Couldn’t turn my chair around because wait staff and managers were constantly walking through. Even with moving as far in as possible, constantly had staff hitting up against me. Way over priced. Keith, Sorry to hear about your less than ideal experience. Especially, sorry that we didn't have the opportunity to fix the issue night of. I did notice you left this feedback on your comment card but by the time I went to find you, you had already left. Should you give us another chance please be sure to reach out to me directly so that I may ensure we best accommodate you. Jack. AGM. Very good! The waitress was not that kind. The place is very beautiful. Love the vintage Paris vibe of this place! We had dinner, caught a jazz set while sipping champagne and cocktails...what’s not to love? It was a great date experience and we look forward to coming back again soon. Great jazz experience. Good cocktails. Strongly recommend. Thanks for the positive feedback. Glad you had a good time. Jazz show and drink service was excellent...super fun night! Great place for drinks, great music, and relaxing. Nice to hear you had a great time. We look forward to welcoming you back! Love this place! The woman at the front of house was wonderful and helpful, even answered the phone as we called to say we'd be a bit late for out reservation. When we arrived, at 10:30 on a Saturday night, she was warm and welcoming, and made sure to have us seated at a table that would be comfortable for the elders in our party. The best was Chino Pons and his fantastic Cuban band, great salsa dancing and a great vibe. SarahD, Nice to hear you had a good time with us! We look forward to welcoming you back. Jack.